Floor-length skirts run the gamut from casual summer day wear to formal evening attire and can be made from a variety of fabrics and textures for drastically different looks. You can spend a lot of money on these different kinds of floor-length skirts, or you can master a simple floor-length skirt pattern and alter it to suit your needs. You will save money and have complete control over your fashion choices, making skirts perfectly suited for you. Measure your waist and hips with a measuring tape. Measure from your waist to the floor; this is your “base skirt length.” Write all of these measurements down. Using a skirt pattern of any length -- ideally without pleats and ruffles -- cut out the pattern pieces you need as indicated in the directions. 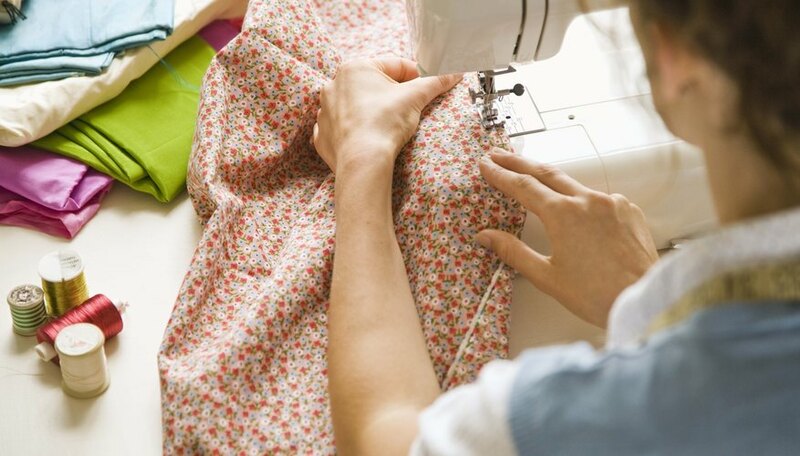 If you need to lengthen your skirt pattern pieces because your pattern is for a short or medium-length skirt, lay your pattern pieces on a hard surface. Overlap the lower edges of each skirt piece slightly over a piece of tissue paper and tape into place. Measure the length of the “base skirt length” from the center waist area of each pattern piece down to the tissue paper. Make a mark to indicate this length. Draw a horizontal line on this mark to indicate your new hemline. Use your ruler to draw straight vertical lines to connect the side lines of your pattern piece to the new hemline you just drew, lengthening your pattern piece. When you are done, you pattern pieces will be appropriate to make a long skirt. Lay out all of your newly lengthened pattern pieces on your fabric and pin the pieces in place. Cut them out with your scissors. Take out the pins and set the pattern pieces aside. Place the skirt pieces with the right sides together and pin the long-side seams together; consult your pattern instructions if necessary. Thread your sewing machine and sew together the skirt along the side seams using the seam allowance listed in your pattern instructions. If no seam allowance is listed, use a 3/8-inch allowance. Fold the waist of your skirt down toward the wrong side of the fabric and pin it into place as shown in the diagrams of your pattern directions. Sew your waist as directed by the pattern. Turn your skirt right-side out and try it on in front of a full-length mirror. Use the chalk pencil to make a horizontal mark on the front of the skirt where you want the hem of the skirt to be. Measure 3/4 inch below the horizontal mark you made with the chalk pencil and continue this mark around the entire circumference of the skirt. Cut your skirt off at this line. Turn your skirt inside out. Fold up your the of the skirt 1/4 inch around the entire circumference of the hem. Iron to keep the fold neat and even. Fold up an additional 1/2 inch around the entire hem. Iron and then pin into place. Sew around this pinned hem area with a 1/4-inch seam allowance. Remove the pins. Turn your skirt right-side out and iron the entire skirt. Select a skirt pattern marked “Easy” or “Quick to Sew.” Purchase the correct size for your measurements by comparing hip and waist measurements to those listed on the sizes on the pattern. Purchase the amount of fabric indicated on the pattern. If you purchased a short- or medium-length skirt pattern, purchase at least one extra yard of fabric.